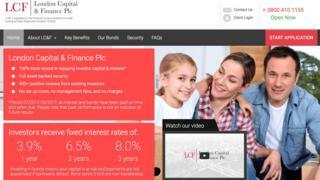 Image caption London Capital & Finance marketing promising returns up to 8% over three years. Thousands of first-time investors who lost their savings through investment with London Capital & Finance (LCF) are unlikely to qualify for compensation. Nearly 12,000 people put more than £230m into the firm which collapsed in January. The Financial Services Compensation Scheme (FSCS) acknowledged that the investors had lost money "through no fault of their own". But it told the BBC "there were no grounds for offering compensation". "The bonds themselves were not regulated products, and on our current understanding, we do not believe that customers were given personal advice to buy the bonds. Mr Neale said consumers may be confused by the fact that the collapsed company was regulated to give financial advice only. LCF advertised itself as a low-risk ISA, and promised to spread funds between hundreds of companies. In reality, the fund did not qualify as an ISA, and the money was only invested in 12 companies - 10 of which were described as "not independent" from LCF, in a report by the fund's administrators. There were a number of "highly suspicious transactions" involving a "small group of connected people" which led to large sums of investors' money ending up in their "personal possession or control"
Administrators Smith & Williamson have asked four people, Andy Thomson, Simon Hume-Kendall, Elten Barker and Spencer Golding to return funds. They say Mr Hume-Kendall and Mr Thomson have agreed to pay these monies into a holding account to be paid to bond holders in the event they do not receive a full return of their money. Spencer Golding and Elten Barker declined to do the same as Mr Hume-Kendall and Mr Thomson. They told the administrator that they "believe the bond holders will be paid back in full through the assets which LCF owns". Simon Hume-Kendall declined to comment to the BBC. Andy Thomson, Elten Barker and Spencer Golding have not responded. "We are working closely with administrators to try and understand how these bonds were sold," said Mr Neale. "If there is any legitimate basis under our rules for compensating, then we shall absolutely do so," he added, but said he did not want to "raise false hope". He called for greater "clarity" in the rules about what the ombudsman service protects so that "people don't fall into the trap that they have fallen into here". Administrator Finbarr O'Connell told Money Box that "at best" LCF bondholders can expect to get around 20% of their money back, but it could take up to two years. Mr O'Connell added that the Serious Fraud Office has opened an investigation into individuals associated with LCF. On 4 March 2019, four individuals were arrested in the Kent and Sussex areas, the SFO said. The four individuals, who have not been named, have been released pending further investigation. "The SFO, in making arrests, is clearly focusing on whether assets have gone outside of these companies and whether there are assets which potentially they could recover for the bond holders," Mr O'Connell told the BBC. Money Box can be heard in full on the BBC Sounds app.